Almost three decades since they began making wine in their basement, Rick and Amy Barr have — bottle by bottle — built a small fruit wine empire on their family acreage in Sherwood Park. Almost three decades since they began making wine in their basement, Rick Barr and his wife Amy have — bottle by bottle — built a small fruit wine empire on their family acreage in Sherwood Park. 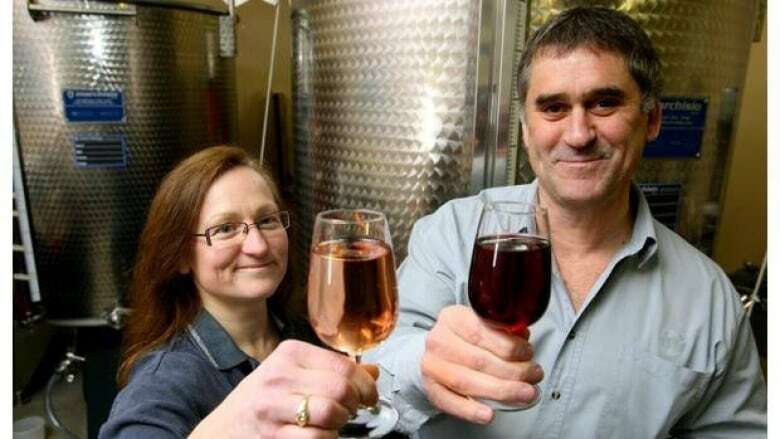 They now produce 12,000 bottles of wine a year from rhubarb, raspberries and sour cherries, all grown on the grounds of their cottage winery. "Just like a lot of people, we just started making it in our basement and we happened to have in our backyard both the rhubarb and the raspberry," Rick Barr, co-founder of Barr Estate Winery. "That's why we started with those because we knew they would make a nice wine." Both Barrs worked in heart research at the University of Alberta for more than 20 years and their scientific training came in handy when they began fermenting at home in 1990. Back then, they lived in a tiny house in the city but they felt cramped and longed for a simple life in the country. For years, they shared the fruits of their labours only with friends and family, but when the Alberta government loosened up the regulations around small wineries, they decided to go commercial. Barr Estate Winery was born. They landed their cottage winery licence in 2005 and sold their first bottle in 2010. "At that time, you only had to make 4,500 litres a year and we were probably making over 1,000 litres a year just for family and friends," Rick Barr said. "You get a lot of friends when you're making free wine." Nearly a decade since that first bottle hit store shelves, the winery remains a family-run operation. Amy's parents Mike and Jeanette Cholowsky are partners in the business. Mike Cholowsky homesteaded in Strathcona County years ago and grew raspberries on the family farm. Jeanette Cholowsky was able to nurture a few of those heritage plants into the thousands the family still cultivates today. They use a harvester to cull their fields of Carmine Jewel sour cherries, but everything else is picked by hand. And it's a long harvest season. "We're totally busy all summer," said Rick Barr as he walked along the rows of rhubarb stalks and cherry trees. Once the fruit is plucked from the field, they use a hydraulic press to squeeze out the juice and then transfer the liquid into fermentation tanks. "When we used to do it in the house, we used to do it in smaller pails and now we do it in bigger pails," he said. The bottling and corking is also done with little in the way of advanced machinery. When the time is right, Rick washes the bottles, Amy fills them with wine, and Jeanette carefully corks each one. "It's pretty simple and it's one of the funnest jobs that we do," he said. Barr said he has no regrets about leaving the city life behind. The heavy labour rarely feels like work, especially when sampling some of their own product. "We just drink wine and shoot the breeze all day. That's really what we do," he said. "We could automate it — but why take away our fun jobs?"